Apart from shooting HD video as its main diet, the HM-TA1 is no slouch when it comes to being a multi-tasker, working as a Web camera for folks who have yet to own something like this in their homes. Granted, a whole lot of notebooks and Apple MacBooks come with a built-in web camera these days, so it will probably go down well with desktop owners. All you need to do is plug it into an available USB port and you’re good to go, as the TA1 will play nice with IP-based video chat programs such as Skype. It is extremely pocket friendly in terms of dimension (and price, which you will find out later), measuring just 2.09″ x 0.7″ x 4.09″ while tipping the scales at a mere 0.25lb, including a battery and SD memory card. Each TA1 will come with a wrist strap, making it perfect for being carried around without worries of losing it. With single-function buttons such as Power, Play, Record, Still Photo, LED Light (on/off) and Delete, even beginners are able to get straight into the middle of video recording action right out of the box. Shooting stills of up to 8-megapixels is another ability found on the TA1, making it another secondary digital camera device for your home. 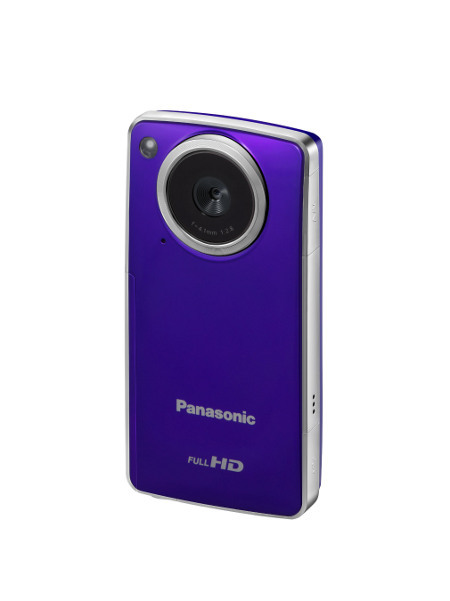 Out in purple, dark grey and red color options from next month onwards, the Panasonic HM-TA1 will retail for $169.95. USB terminal slide lever sticks, and, really, this and all of the covers (battery, card) are cheap plastic and don’t close/open well. I’m still charging the battery for the first time and am afraid the plastic components are going to break.